6th rib in the midclavicular line. 8th rib in the midaxillary line. 10th rib at the lateral border of erector spinae and ends 2 cm lateral to the spine of T10 vertebra. 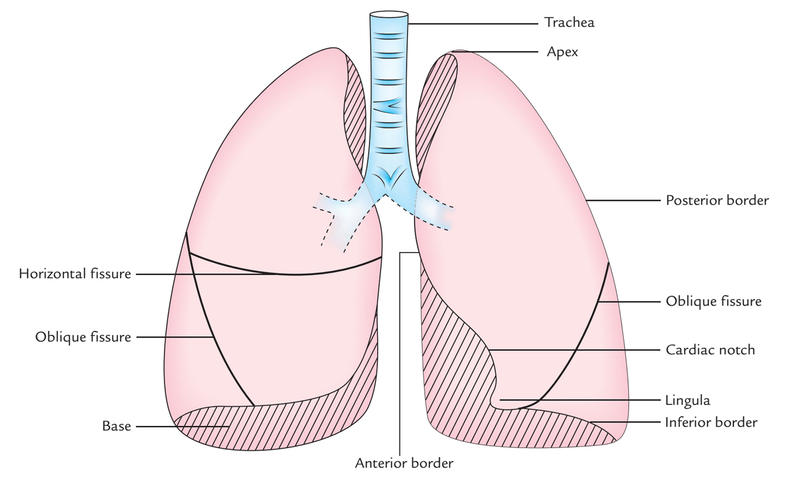 The anterior border of the left lung has a distinctive notch (the cardiac notch), which enters laterally behind the 4th and 5th intercostal spaces. Its lower end ends at the level of spine of T10 vertebra. The oblique fissure is indicated by a line drawn obliquely downwards and outwards from 1 inch (2.5 cm) lateral to the T5 spine to the 6th costal cartilage about 1/ inches (4 cm) from the midline. In clinical practice, ask the patients to abduct the shoulder to its full extent; the line of oblique fissure in this position corresponds to the medial border of the rotated scapula. The transverse fissure is marked by a line drawn horizontally along the 4th costal cartilage, and meets the oblique fissure where the latter crosses the 5 th rib. The right side of chest mostly presents upper and middle lobes divided by the horizontal fissure at about the 5th rib in the midaxillary line to 4th rib in the sternum. The left side of chest mainly presents upper lobe, that is divided from the lower lobe by oblique fissure going from the 5th rib in the midaxillary line to the 6th rib at the midclavicular line. With the exception of apices, posterior aspect of chest on each side mainly presents lower lobe stretching from spinous process of T3 T10 or T12 vertebrae. 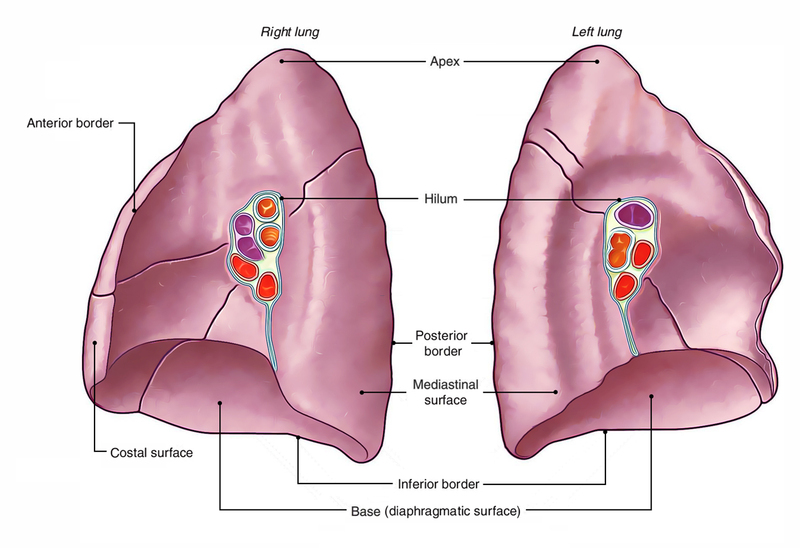 The lung is located deep to the area going from axilla to the level of the 7th or 8th rib. The upper lobe is demarcated in the level of the 5th rib in the midaxillary line and 6th rib in the midclavicular line. The lung is located deep to the area going from axilla to the 7th or 8th rib. The upper lobe is demarcated in the level of the 5th rib in the midaxillary line and 6th rib in the midclavicular line. The superior lobe of the right lung is perceptible above the 4th rib. The middle lobe of the right lung is perceptible between the 4th and the 6th rib. The lower lobes of both lungs are perceptible below the 6th rib on the front. The inferior lobes of the left and right lungs are best examined on the back, notably in the region of the triangle of auscultation.